My favorite! 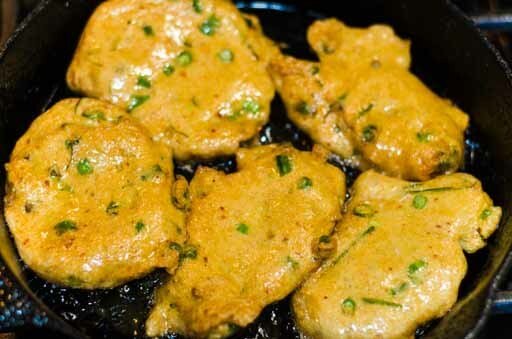 As a little kid, I was fascinated by the Tod Mun stall at markets, seeing the fish cakes puff up and float in hot oil. The lady would form the patties by dropping a spoon full of fish paste into a circular, 2 inch in diameter bamboo sleeve. She would quickly level the cake and scrape it off into the wok full of hot oil. A few seconds later, the round patties floated to the top all puffy. But they only stayed puffy until they were scooped out of the wok. As they cooled, they went back down to their previous size. I called them the ‘deceitful tod mun’. Tod Mun is eaten as a snack or appetizer in Thailand. But as with many Thai appetizers, Tod Mun can be eaten with rice as a main course. 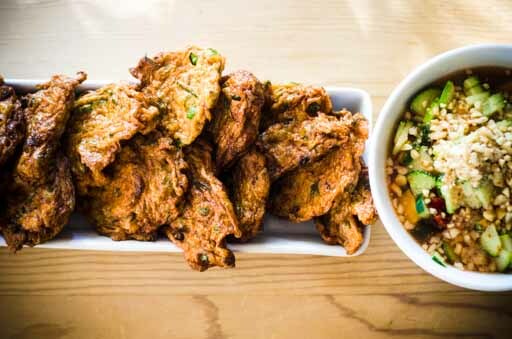 The salty and spicy fish cakes go so well with the crunchy and nutty cucumber sauce. I find using dace fish paste is the best for this recipe. If you can't find kaffir lime leaves, omit them. Dry ones won't do the trick. If the mixture is not well mixed, Tod Mun will not be chewy when cooked. It will tend to break easily. Inconsistent results can also come from the wrong type of fish or how fresh the fish is. 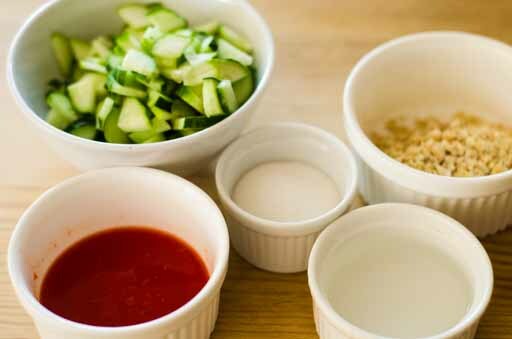 You can substitute Red Curry Paste for Basic Red Curry Paste. Stack all the kaffir lime leaves and roll them tightly. 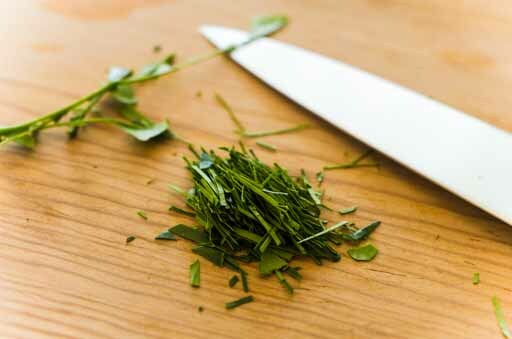 Slice the roll of leaves into very thin strips. Slice green beans into cross-sectional pieces, 1/8 inch (1/4 cm.) thick. 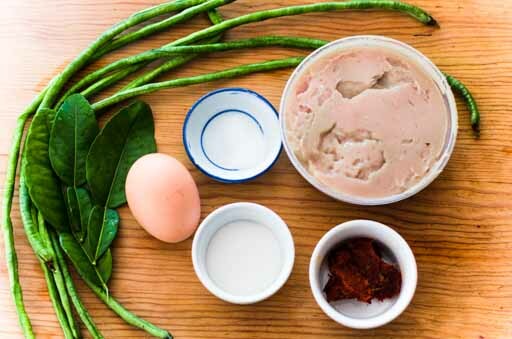 Mix all the ingredients, except for the kaffir lime leaves, green beans and oil, in a bowl. Oil is for frying only. Stir until the mixture becomes a paste with smooth and shiny consistency again. For some fish pastes, it takes 3 minutes to get the smooth texture. 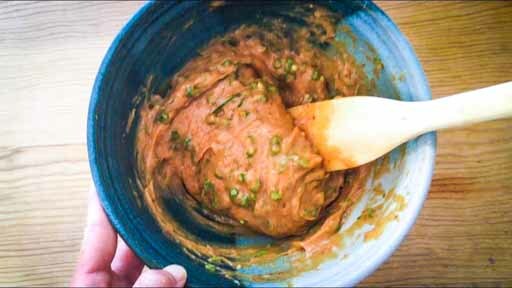 For other fish pastes, you may want to use a mixer on low power because you'll be churning it for 1/2 hour by hand. There's no way I've found to make sure that the fish paste is good before working with it. Then, add kaffir lime leaves and green beans and stir again to mix them in. 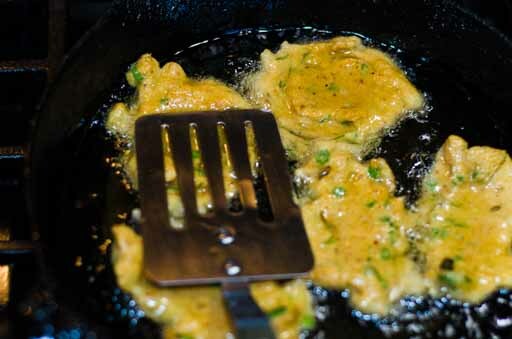 In a flat bottom pan, heat up the oil on medium heat. Test the temperature by dropping a smaller piece of fish paste mixture in. When the oil is ready, the mixture should puff around the edge. 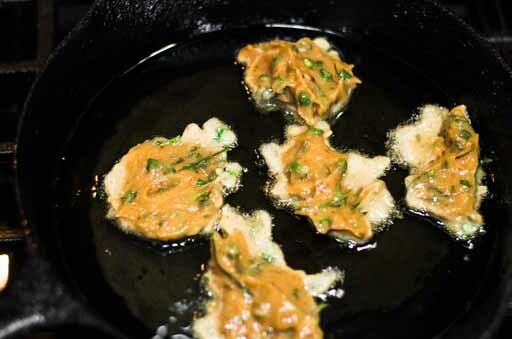 When the oil is hot enough, drop a tablespoonful of fish paste in the pan. When the down side has cooked, use a spatula to loosen the tod mun, then flip the uncooked side down and push it down with the spatula to make it flat like a pancake. Flip again to get both sides brown. Drain or pat with paper towels to remove the oil. Serve hot with the sauce below. As always with Thai food, tasting is the key. Add a little more of red pepper sauce if you like it hot. Or add a little more of the sugar if you like it sweet. I use 2 small pickling cucumbers but any variety of cucumber will. 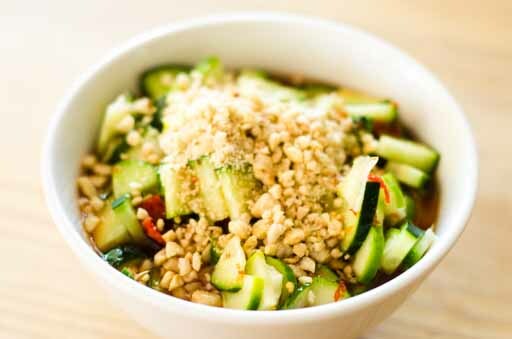 You can always add more cucumbers to the sauce, too. If you're using raw peanuts, toast them in a pan for 5 minutes or until they're cooked. 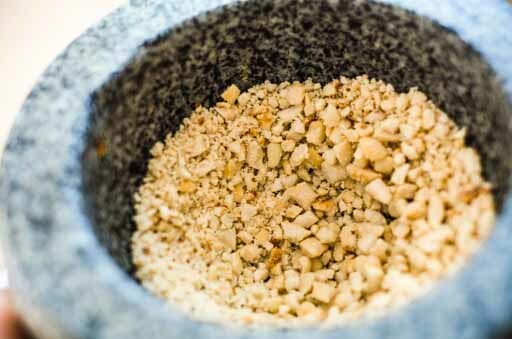 Coarsely grind the peanuts in a mortar and pestle. 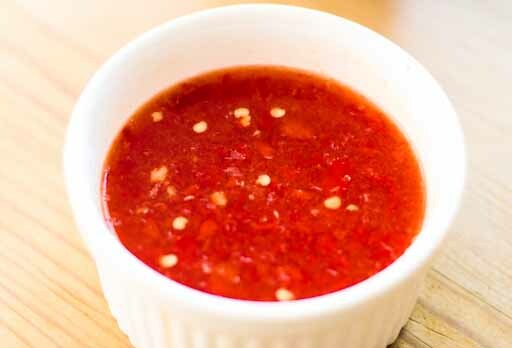 Combine vinegar, sugar and chili garlic sauce together in a small bowl. Heat the mixture in microwave until the sugar is dissolved for approximately 1 minute (picture 4). 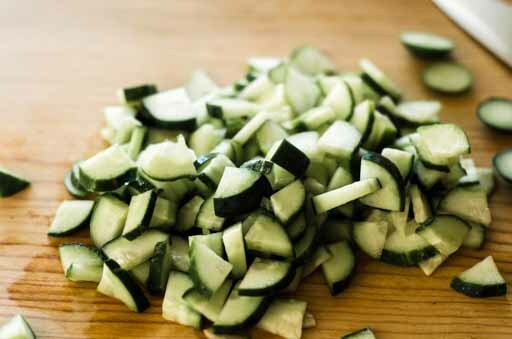 Add the sliced cucumber and mix well. Top the sauce with the peanuts. Refrigerate the sauce until Tod Mun is ready.